The Elgin slip and fall accident attorneys of Rosenfeld Injury Lawyers LLC fight for the rights of those who have been hurt because of negligent property owners or employers; whose irresponsible actions have threatened the safety of the public. Property owners are held to a duty of care which requires them to maintain their premises in a manner that ensures the safety of all those who are permitted on their property. If you have been injured, we can help you recover the compensation you need to cover the cost of your medical expenses, lost wages, out of pocket expenses and pain and suffering. Accidents can occur anywhere, sometimes forever changing the lives of the unfortunate victims. When this occurs, it is important to hold property owners accountable when their actions contributed to the catastrophic result. When determining whether a property owner, management company or employer is responsible for an accident, we consider what reasonable actions others would take in a similar situation. Here are some examples of cases where the property owner or employer may be held liable. Failure to remove snow or ice— during inclement weather, it is the property owner's responsibility to clear sidewalks leading into the building and to plow parking lots so that tenants and guests can walk into and out of the building without fear of hitting a patch of black ice. Failure to provide adequate lighting— people deserve to be able to see where they are going and property owners must make sure that hallways, staircases, entrances, and exits are all well-lit so that guests can see if there are objects in their way which could pose a hazard. Failing to maintain sidewalks and pavement— potholes, uneven pavement and other defects that result from the failure to maintain the pavement and sidewalks regularly can be a contributing factor in an accident. Poorly maintained guardrails— failure to correctly install or inspect guardrails has contributed to some falls from balconies and other elevated structures. Property managers must make sure that balconies are properly equipped and that rails are regularly repaired. Slippery floors— maintenance staff is required to mark off areas that have recently been mopped or are wet due to the accumulation of water from inclement water or maintenance issues. Without warning indicating that floors may be slick, guests might be injured. Workplace slip and fall accidents— many of the hazards that result in premise liability claims are also present on the job. Employers are required to minimize the risks to employees wherever it is reasonable, which includes warning of hazards, keeping workspaces free of clutter and maintaining guardrails and other protective devices. We've handled thousands of slip and fall claims and know how suddenly an injury can change your life. Even if you can recover, the time and effort it takes to go through rehabilitation can create unneeded stress without the worry of whether you will be able to support your family while unable to work. Following are some of the common injuries we have encountered. Nerve damage— while bones, muscles, and skin can all heal following an injury, nerve damage is permanent and may cause the loss of feeling, shooting or sharp pains, limited motor function and partial paralysis. Since there is no way to regenerate or repair damaged nerves, the impact of these injuries stays with the victim for the rest of his or her life. Injuries to the brain— blunt trauma to the head can cause permanent brain damage over time, and the symptoms may not surface for weeks or months following the incident. Common complications include neurological disorders and the loss of cognitive function. 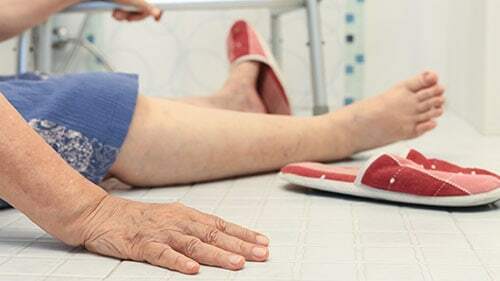 Fractures— broken bones are an unsurprising result of slips and falls because of the toll that an impact with a hard surface can have on the body. The severity of the break and the treatment required to repair it can vary depending on the location and type of fracture. Death— when someone dies due to the actions of a negligent property owner or employer, his or her family has the right to take legal action to hold the responsible party accountable. If you have been injured in an accident, Rosenfeld Injury Lawyers LLC would like to invite you to arrange a free consultation with one of our attorneys so that you can learn more about your rights and options. We have helped thousands of people just like you and guarantee that we will produce results—or our services are entirely free of charge. Contact us today to arrange your case review with an award-winning Elgin slip and fall accident attorney so that we can gather the information we need to get started on your claim. Once we have performed our investigation, we can let you know more about your available legal options so that you can decide best how to proceed.